Chalk me up on there on the list of people who love EPT but have never played. Part of me thinks there's just too much detail there to make it playable, but then again that never stopped people liking Forgotten Realms. "Sadly, the history of the game is less about people playing games set in Tékumel and more about people talking about Tékumel"
The same problem that beset Traveller with its Third Imperium - I recall vaguely some GDW person saying that most of their sales were to people who bought stuff to read about the TI, maybe roll up some characters, design some spaceships etc, but not to actually play the game. This then seems to be a common problem with setting-rich RPGs, and one that is incentivised by publishers knowing that the setting-fetishists are their most reliable customers. I've even felt a little of this tendency with the Wilderlands of High Fantasy, buying everything I can get hold of and then feeling intimidated about running a game there! Which is ridiculous; Wilderlands is not a coherent gem like Tekumel but a morass which makes up for in gameability what it lacks in coherence. I wonder, noisms, is that because Forgotten Realms has reams of hand-holding material- introductory modules and so forth- that make it simple to ease into the setting? Provided that there is a springboard into the world, all the incredible detail could be made on a "need-to-know" basis. I've always been theoretically fascinated by this "other D&D". What would the hobby look like today if Tekumel had become incredibly popular? EPT instead of Dragonlance, as it were. I say "theoretically fascinated" because I've never actually seen a Tekumel supplement in real life. I actually played it, back in the day. I forget exactly why we stopped, though knowing me it's because I had just bought (or written) a new system/setting and was eager to try that instead. My group is actually very keen to get back to our EPT game. I tend to run episodic campaigns, regardless of setting or system, which may not play to Tékumel's strengths, but it's a wonderful game despite a few (easily fixed) mechanical niggles such as rolling a percentage for starting abilities... MP3 recordings of our first sessions can be found on the web, although I don't especially recommend them. The availability of a cheap PDF doesn't seem to have done much to increase play of EPT, so perhaps these days unlike in the 1970s price is not the issue at all. EPT's biggest obstacle for me and my group when we played was that it simply didn't fit our tastes. As an expertly realized example of a culture different from our own and the RPG-usual pseudo-european, it was just too different for my group to get a handle on and have fun with. It's a bit of a bummer, because I really liked how the alien races were portrayed as genuinely unusual and sometimes outright weird. It was refreshing to see. Worse still, to my mind, is the tendency of [...] fans, then and now, to obsess over minute details and seek out ever ever more exhaustive [...]. As such, I don't mind at all people delving deeply into the minutiae of Tekumel. I would rather study the intricacies and complexities of Tekumel than conduct a D&D game therein (though, of course, one does not exclude the other). Plus, let's remember than Tekumel existed before D&D. The world of Tekumel exists on its own terms, and the RPGs based upon it are only a single facet of a much larger jewel. The fun thing about EPT is its relative ease of conversion with OD&D - even if you don't have time to run a full Tekumel game, surely there is room in any megadungeon for a Tekumel-inspired level full of eyes and Tekumel creatures. I know it's one of the things I will be getting to in my own dungeon work, and in the mean time I have actually used a couple of EPT creatures as wandering encounters. Really tends to freak players, used to D&D monsters, out. My friends and I played the hell out the Gamescience version back in, must have been '85-86/87. It was a blast. I was running the game, so I really immersed myself in the world: I bought and read the novels, the Book of Ebon Bindings, the big terrain hex maps that were available, etc. I'd love to get back to it with the '75 rules at some point. My neighbor down the street is a Tekumelani from way back; he even dug out his pile of rules and other ephemera for me to peruse, including an original copy of Missum, the wargaming rules. I think it's awesome that, not only is stuff still being published, but it's being published in the pages of our very own Fight On!. Everyone was talking about it at the game store I went to as a kid. But nobody tried to run it. I sold my copy on Ebay a few years ago, along with a bunch of my old school stuff. Man, I wish I had kept it. I've never heard of this game, but it sounds really cool. I'd love a chance to look through it. Mike Mornard (who played with Barker as GM) has addressed the problem of the setting in some posts on rpg.net. As is always the case with the Geezer, he says that they just made stuff up that sounded like fun. In other words, as a game, EPT was meant to be acid-trippy Barsoom fun and NOT an exercise in world-building (although I assume that it was different for Barker in private). I have a similar history with the game as you. I recall a review in an early issue of The Dragon which really excited me, but I never saw the damn game. The recent GoO's game was way, way too dense with detail (pages and pages about the various clan, etc). Then, I got the pdf of the '75 game (because of Mike's posts, actually) and was stunned. There's a bit of setting info to give you the mood, but mostly it's just old-school dungeon bashing oozing flavour. I'd love to play THAT game. I also keep thinking about incorporating the damage mechanic into OD&D. The picture of that box makes my hands twitch. Must open! Must read! Maybe that was my problem, because to be accurate, I was playing the GoO version as well, and boy is it setting dense. I've also never played, only read. I think the setting's main flaw is the prep time. Not just the GM, but the players themselves need to know a fair bit about it for anything to make a bit of sense. It's not like regular "cliche D&D" where every assumption is in place and you can say "I'll be a dwarf fighter" and bam, you're playing and having fun. Wow. A look at eBay shows a copy of the game for EUR 197,24 + EUR 40,19 shipping and handling to Switzerland. That's more than USD 300! That's one of the reasons why the original "scenario" was for the PCs to be barbarian outlanders just arrived in Jakalla. You encounter the world as your character does. In my last game I had the players create the island culture their characters were from (a short discussion before play, nothing terribly involved), so they felt at home with it and could more easily make the transition without either learning all about Tsolyani society or wondering where they were supposed to have come from. It worked well, although now everyone wants to skip that bit and play higher level Tsolyani characters. True, but you still have the players doing a lot of studying on the setting, they're just getting their infodumps in play from the GM. A fantasy world that isn't based on the broadest genre conventions are a little intimidating for many. One that aren't even based on Western culture much moreso. Very much agreed. I'm half-tempted to try my hand at writing up an Underworld adventure for FO! Me too. There are a number of little bits like that in the game that I think are superior to their OD&D counterparts. Getting an original copy of the game is very expensive. I was lucky to get mine quite inexpensively. That's one of the reasons why the original "scenario" was for the PCs to be barbarian outlanders just arrived in Jakalla. It's frankly a terrific set-up for the game and one of the reasons I'm so tempted to play the game is that I want to give this starting point a whirl to see how well it works for my group. That is true, and for sure shows just how great a setting and system Runequest was seeing as how popular it was in the 80's. I guess the easy system made things less intimidating. You can also buy the main book at RPGnow. Back when I was aware of it and it was in print, it was available only by mail order and too pricey for me -- all my D&D and AD&D books were second-hand. 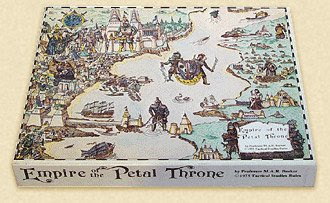 Somewhere, though, I acquired the Legions of the Petal Throne miniatures rules and a handful of figurines (not enough for even a single unit). I passed up a "collector's item" set at an SF convention, and even the War of Wizards board game for IIRC a pretty good price. The unfinished Swords & Glory was both way too much information and way too much game for me to digest. I'm not about to part with the books (and especially not the maps! ), but I think it can be a hindrance to imagine one must be up on all that "canon" to run a game. Although I don't have them, the "Growing up on Tekumel" books from the Gardasiyal line looked pretty accessible. Different Worlds Publications did a nice edition of the original rules, and that was more my speed. The PDFs of the whole original edition IMO set the gold standard for such products; everlasting glory to Victor Raymond! EPT itself contains, I think, just enough background material. The similarities with D&D ease the way, as does the "barbarians just off the boat" premise for PCs (although I later used my version of Pechano as a default homeland). For more "serious" and native-Tsolyani oriented games, my favorite rule set is Tirikelu. I've also played AD&D, The Fantasy Trip, Tunnels & Trolls and RuneQuest versions. I have been a fan of Tekumel for over a decade now. It is an amazing world. If you want to get a feel for it, the best way is perhaps to read the novels (there is a series of 5 novels by Barker starting with "Man of Gold"). Carl Brodt, the proprietor, is a great guy to do business with. I have bought many things from him. There are a wealth of Tekumel products: books, games, miniatures, even books and a CD on how to speak Tekumel's fantasy languages! The Gamescience version of Swords & Glory is the most info-dense gaming supplement I have ever owned (and that's saying something if you've seen my basement). The Book of Ebon Bindings (Tekumel's book on demonology) is my favorite RPG supplement I've ever read. It is a wealth of information on the world of Tekumel and the Empire of the Petal Throne. For the record, the text of the Different Worlds 'Magenta Cover' is essentially the same as the original TSR edition. It's generally available on the secondary market at a considerably lower price. you still have the players doing a lot of studying on the setting, they're just getting their infodumps in play from the GM. This might sum up the past decade or so in gaming, I think: an impatience with actually engaging in alternative worlds, a desire to explore the already familiar, while that familiar is itself always changing (flamewar in 3...2...1...). I always felt that much of the point of fantasy and SF as genres, and of playing in someone's homebrew campaign, was that you'd learn about the setting as you played and be surprised, too. OTOH, player culture shock is rarely fun - it's turned me off Talislanta among other games, but it can happen, depending on your players' background, in any setting - even 20's CoC. The "visiting barbarians" ploy strikes me as very smart. Oh yeah, wasn't there an overabuncance of commas in names? PLAYER:"S'rith'n'tith takes out his B'dadt'tro'ta blade and walks in." GM: "you see three Ch'wa'datho'ta beasts snarling and gibbering at you. They are guarding a chest filled with gold and a plate of fruit from holy the Bla'n'sa bush"
PLAYER: D'tatha'khan should cover us with his b'tota'ta bow and we'll move in to attack..."
A fantasy world that isn't based on the broadest genre conventions are a little intimidating for many. I'm sure that's a hindrance nowadays, but what about back when the game first came out and those genre conventions didn't necessarily exist yet? "Getting an original copy of the game is very expensive. I was lucky to get mine quite inexpensively." Heh - I got mine this past year at a Con flea market sale for about $10 - box and *written upon* book. I remember seeing EotPT some odd 30 years ago as a tyke. I pulled it off the game store shelf, but it wasn't D&D, and I didn't have quite enough allowance for such a thing. ... and was therefore quite glad to indulge my nostalgia recently. I'm pretty sure my copy came in a plastic bag with no box originally. Did the first printing have no box? I remember selling it on ebay a few years ago (sad face), but the buyer left me a negative saying "No box!" Hey, that was how I bought it at the shop when it came out back in the day. This. IME it's the only reasonable way to introduce unfamiliar players to Tékumel -- with characters as unfamiliar with that alien world as themselves. Seconded. A magnificent work. Prof. Barker out-Lovecrafts Lovecraft. I found the GoO version a classic example of a game that was more interested in showing it's setting than in showing you how to have adventures. There are a number of little bits like that in the game that I think are superior to their OD&D counterparts. I just got the original rulebook (not the maps and box, just the rulebook) for 20 bucks, 24 w/shipping, from EBAY! I am eagerly awaiting it, everything I have read about it sounds like it is going to be right up my alley. Tekumel — you either love it or hate it. I love it — in fact I'm an addict! I'm quite comfortable with the "alien-ness" of the setting. It's George Orwell and The Curse of the Golden Flower meets 70's glam-rock and the "culture of celebrity." An Emperor/Empress who’s never seen after ascending the throne owns everything, land, buildings, even you. The imperial coat-of-arms, the Seal of the Imperium, is present at weddings and in the dining-hall of your clanhouse. The imperial secret service, the Omnipotent Azure Legion, is everywhere, always watching, always protecting you. Every city has a Palace of Foreign Lands, Palace of the Priesthood of the Gods, Palace of Ever-Glorious War, and a Palace of the Realm. You love the Emperor/Empress! In this society, appearance is EVERYTHING — what you wear and how you look matter immensely, the impression you make on others determines how you are treated, and no-one takes a step away from her/his sleeping-mat without donning some visible marker of social status and religious affiliation. The society is a nice mix of the oppressive and the liberated, violence is shockingly immediate yet there are delicacies of behaviour that surprise "Western" sensibilities). In the game, social action is just as important and detailed and dangerous as a good dungeoncrawl (and the dungeons make sense). Place, family, honour, and action matter. Characters have a purpose and a sense of belonging. As my T:EPT GM remarked, "Warriors bedecked in plumes fighting each other with outrageous alien plexiglas swords in formal savage duels while sorcerers chuck bolts of dimensional energy and wield ancient high tech artefacts ... pulp aliens, Buck Rogers starships, giant temple drums, and legions of Xenas - what's not to like?"